THIS AGREEMENT (this “Agreement”), dated on this day, by and between GutenMarkt, Inc. (which owns and operates BicycleMotorWorks.com), hereinafter referred to as “GutenMarkt” and the undersigned, hereinafter referred to as “Seller”. 1. Services. Seller authorizes GutenMarkt to provide the following services in accordance with the terms and conditions of this Agreement which are described in an appendix hereto (the “Items”), to list, offer, and sell the Items on GutenMarkt’s website. GutenMarkt will use commercially reasonable efforts to sell the Item(s) at the listing price and will accept no less that the reserve amount authorized by Seller unless authorization is received from the Seller in writing. GutenMarkt will offer payment method options to the Seller and Buyer but shall not transfer funds or act as a financial intermediary for any purpose or transaction. 2. Shipping. Seller is responsible for all the costs associated with shipping the Item(s) to GutenMarkt and/or Buyer, including packing and shipping charges, returns, insurance costs, other handling expenses, and risk of loss or damage incurred in both the delivery of Item(s) and in the return of Item(s) as applicable. 3. Price. The listing price of Item(s) is determined solely by the Seller. GutenMarkt makes no claim to the future value of listed Item and GutenMarkt has the right to refuse in its sole discretion any and all consignments of Item(s) with unrealistic listing prices or priced beyond the current market value. 4. Binding Bids. Seller is obligated to complete the transaction with the highest bidder upon the listings completion, unless there is an exceptional circumstance, such as (a) the Buyer fails to pay for the Items or (b) GutenMarkt cannot authenticate the Buyer’s identity. 5. Listings. GutenMarkt shall have, in its sole discretion, the ability to refuse to list any item, listing or account. Seller agrees that all concerns, comments and disputes shall be forwarded to GutenMarkt in the first instance. However, nothing in this paragraph shall impose any duty on GutenMarkt. 6. Unsold Items. Should the Items fail to sell within ninety (90) days from the date first listed for sale (or the last re-listing authorized by Seller below), Seller hereby authorizes GutenMarkt to: Continue to re-list each unsold Item (each an “Unsold Item”) for six (6) successive periods of fourteen (14) days at the original offering price or a price that declines by 10% each time the Unsold Item is re-listed. 7. Bailment Relationship. The relationship between the Seller and GutenMarkt is that of a bailor and bailee in which the bailor (Seller) deposits his personal property (Items) with the bailee (GutenMarkt) for the purpose of listing and selling the Items to third parties. Nothing contained herein will be construed as creating any agency, partnership, or other form of joint enterprise between the parties. 8. Title and Risk of Loss. Title and risk of loss for the Items remains with Seller until such time as the Items are delivered to Buyer. Title and risk of loss will not transfer to GutenMarkt at any time. Title to Items shipped will pass directly from Seller to a Buyer. 9. Seller’s Warranties. Seller warrants to GutenMarkt and the Buyer that: (i) Seller is the sole owner of the Items, and has all the necessary rights and authorization to produce and distribute the Items and to permit GutenMarkt to offer and sell the Items to any third party; (ii) the Items and the rights granted under this Agreement do not infringe upon the proprietary or other rights of any third party; (iii) upon sale of any Item hereunder to a Buyer, clear title and right to possession will pass from Seller to the Buyer free from all liens and claims; (iv) Seller has provided GutenMarkt with descriptions of all Items and all information that Seller possess regarding the Item(s) origin; (v) the description of each Item is truthful, accurate, complete and not misleading; (vi) none of the Items is counterfeit or stolen; (vii) the Items and the rights granted under this Agreement do not violate any law, statute, ordinance, or regulation (including, but not limited to, those governing export control, consumer protection, unfair competition, antidiscrimination, or false advertising); and (viii) none of the Items or rights granted under this Agreement, or the description of any such Items, is defamatory, trade libelous, unlawfully threatening, or unlawfully harassing, obscene or pornographic. In cases of fraudulent misrepresentation, GutenMarkt will automatically notify the appropriate law officials and provide a signed copy of this Agreement along with all contact information to law enforcement. 10. Item Information. Seller shall provide all available information concerning each Item. This may include original provenance, invoice, history, and all existing letters of authenticity. In no instances shall Seller withhold a contrary or negative letter of opinion from GutenMarkt or Buyer. All information associated with an Item shall be made available to any interested parties. 11. GutenMarkt Rights. The GutenMarkt reserves the right to reject or return any Item(s) deemed inappropriate or offered at a level higher than current market value as determined by GutenMarkt it its sole discretion. Seller authorizes GutenMarkt to rescind the sale of an Item(s) if GutenMarkt discovers the Item(s) was inaccurately represented by Seller or if it is found to be a forgery or counterfeit. If GutenMarkt notifies Seller of such a rescission, Seller agrees to return all proceeds paid to Seller in connection with the sale of said Item(s) and said Item(s) will be returned to Seller. 12. Sales Tax. Seller shall be responsible to collect any and all taxes including but not limited to sales tax, when applicable, upon sale of Item(s), and be responsible for remitting all taxes collected to the Pennsylvania Department of Revenue. 13. Breach. Without limiting other remedies, GutenMarkt may in its sole discretion immediately remove any or all listings of Seller’s Items, temporarily suspend, indefinitely suspend, or terminate the Services and refuse to provide future Services to Seller if (i) Seller breaches this Agreement, (ii) GutenMarkt is unable to verify or authenticate any information Seller provides to GutenMarkt, (iii) GutenMarkt believes that the Seller’s actions may cause financial loss or legal liability for the Seller, GutenMarkt’s users or GutenMarkt stores, or (iv) GutenMarkt suspects that Seller (by conviction, settlement, insurance, or escrow investigation, or otherwise) has engaged in fraudulent activity in connection with the Items or GutenMarkt. 14. Indemnity. Seller agrees to indemnify and hold harmless GutenMarkt and (as applicable) GutenMarkt’s parent companies, subsidiaries, affiliates, officers, directors, agents, and employees, from any loss, claim or demand, including reasonable attorneys’ fees, made by any third party due, connected to, or arising out of or relating to the Items, Seller’s breach of this Agreement, or Seller’s violation of any law or the rights of any third party. 15. Warranty Disclaimer. GUTENMARKT PROVIDES ITS SERVICES “AS IS” AND ANY WARRANTY OR REPRESENTATION AS TO THE SERVICES, EXPRESS, IMPLIED, OR STATUTORY. GUTENMARKT SPECIFICALLY DISCLAIMS ANY IMPLIED WARRANTIES OF TITLE, GUTENMARKTABILITY, FITNESS FOR A PARTICULAR PURPOSE, AND NON-INFRINGEMENT. SOME STATES DO NOT ALLOW THE DISCLAIMER OF IMPLIED WARRANTIES, SO THE FOREGOING DISCLAIMER MAY NOT APPLY TO SELLER. THIS WARRANTY GIVES SELLER SPECIFIC LEGAL RIGHTS AND SELLER MAY ALSO HAVE OTHER LEGAL RIGHTS THAT VARY FROM STATE TO STATE. 16. Waiver of Consequential Damages. IN NO EVENT WILL GUTENMARKT BE LIABLE TO SELLER FOR ANY INCIDENTAL, CONSEQUENTIAL, EXEMPLARY INDIRECT, SPECIAL, OR PUNITIVE DAMAGES ARISING OUT OF THIS AGREEMENT OR ITS TERMINATION, REGARDLESS OF THE FORM OF ACTION (INCLUDING NEGLIGENCE AND STRICT PRODUCT LIABILITY) AND IRRESPECTIVE OF WHETHER GUTENMARKT HAS BEEN ADVISED OF THE POSSIBILITY OF ANY SUCH LOSS OR DAMAGE. 17. Limitation on Liability. GUTENMARKT’S LIABILITY, AND THE LIABILITY OF ITS EMPLOYEES AND SUPPLIERS, TO SELLER OR ANY THIRD PARTIES IN ANY CIRCUMSTANCE IS LIMITED TO THE GREATER OF (I) THE AGREED UPON VALUE OF THE APPLICABLE ITEMS, AS SET FORTH ABOVE (OR AN ATTACHMENT HERETO), OR (II) $100. 18. Release. Seller releases GutenMarkt (and GutenMarkt’s related companies, officers, directors, agents, subsidiaries, joint ventures, and employees) from claims, demands, and damages (actual and consequential) of every kind and nature, known and unknown, suspected and unsuspected, disclosed and undisclosed, rising out of, resulting from, or in any way connected with the services of GutenMarkt hereunder. 19. Term. The term of this Agreement will commence upon the date hereof and, unless terminated earlier in accordance with the terms of this Agreement, will continue until all Items accepted for listing by GutenMarkt under this Agreement are sold to Buyer or disposed of in accordance with this Agreement. This Agreement may be terminated by GutenMarkt without notice, for any reason or no reason, at any time. Seller specifically acknowledges that the terms of this agreement may change and that GutenMarkt may impose fees in the future. 20. Disputes; Governing Law. This Agreement shall be governed by the laws of the Commonwealth of Pennsylvania, without reference to principles of conflicts of laws. Any dispute hereunder or in any way relating to the subject matter hereof shall be resolved in the Court of Common Pleas, Northampton County, Pennsylvania. Both parties waive their right to a trial by jury and consent to a non-jury trial. 21. Survival. Unless the context of a particular paragraph hereof provides otherwise, the obligations and rights of the parties shall survive the termination of this Agreement for any reason. The warranties and indemnity will survive the completion of the transactions described in this Agreement. 22. Miscellaneous. All notices or requests will be in writing. Notices will be sent to the parties at the address set forth in the signature block, below. The failure of either party to require a performance by the other party of any provision hereof will not affect the full right to require such performance at anytime thereafter; nor will the waiver by either party of a breach of any provision hereof be taken or held to the waiver of the provision itself. In the event that any provision of this Agreement will be unenforceable or invalid under any applicable law or be so held by applicable Court decision, such unenforceability or invalidity will not render this Agreement unenforceable or invalid as a whole, and, in such event, such provisions will be changed and interpreted so as to best accomplish the objectives of such unenforceable or invalid provision within the limits of applicable law or applicable court decisions. This Agreement is personal to the Seller, and the Seller may not assign rights or obligations to anyone. This Agreement and the exhibits hereto (if any), constitute the entire Agreement between the parties with respect to the subject matter hereof. This Agreement supersedes, in the terms of this Agreement govern, any prior or collateral agreements with respect to the subject matter hereof with the exception of any prior confidentiality agreements between the parties. This Agreement may only be changed by mutual agreement of authorized representatives of the parties in writing. 23. The parties have negotiated this Agreement at arms’ length and no provision shall be construed against any one party because of the nature of its performance hereunder, its draftsmanship of a particular provision or any presumption as to inequality of bargaining power or otherwise. This writing contains the entire Agreement between the parties and supersedes all prior oral or written representations, understanding, promises or Agreements which are not included herein. Operating any type of gas bike, bike motors, bicycle motor, bicycle motors, bicycle engine kits, bicycle motor parts, wholesale bicycle motors or use of a motorized bicycle involves some risk of bodily injury. Buyer accepts responsibility for any and all operation of these products that may lead to personal injury, economic loss, social distress, other losses, costs and damages. GutenMarkt, Inc. is not responsible for injuries and/or damages resulting from operating any of these bicycle motor products. Our bicycle motor products such as gas bikes, bike motors, bicycle motor, bicycle motors, bicycle engine kits, bicycle motor parts, wholesale bicycle engine kits or motorized bicycles are not recommended for use by persons under 16 years of age. Please obey all City and county regulations while using your advertising products. Never operate your outdoor advertising products in an unsafe manner. Check with your local and city laws before use of your products. B.) Our gasoline operated products are NOT compliant with Environmental Protection Agency ( E.P.A. ) or California Air Resources Board (C.A.R.B) for the use on/off Public roads. Upon purchase, the buyer agrees to use products for racing (closed-course competition) only and NOT for on/off public roads. The Buyer understands and acknowledges that operating bicycle motor product(s) entails known and unanticipated risks. Buyer understands that such risks cannot be eliminated by the Seller, GutenMarkt, Inc. without jeopardizing the essential qualities of this activity. The risks that the Seller, GutenMarkt, Inc. is not responsible for include among other things: falling, collision with pedestrians, street, highway or roadway vehicles, striking obstructions or other person, unsafe weather conditions, unsafe bicycle motor installation, equipment failure, and weather conditions including temperature exposure (hypothermia, sunstroke, sunburn, heat exhaustion and dehydration). THE MATERIALS ON OUR SITE MAY CONTAIN INACCURACIES AND TYPOGRAPHICAL ERRORS. GUTENMARKT, INC. DOES NOT WARRANT THE ACCURACY OR COMPLETENESS OF THE MATERIALS OR THE RELIABILITY OF ANY ADVICE, OPINION, STATEMENT OR OTHER INFORMATION DISPLAYED OR DISTRIBUTED THROUGH THE SITE. YOU ACKNOWLEDGE THAT ANY RELIANCE ON ANY SUCH OPINION, ADVICE, STATEMENT, MEMORANDUM, OR INFORMATION SHALL BE AT YOUR SOLE RISK. GUTENMARKT, INC. RESERVES THE RIGHT, IN ITS SOLE DISCRETION, TO CORRECT ANY ERRORS OR OMISSIONS IN ANY PORTION OF THE SITE. GUTENMARKT, INC. MAY MAKE ANY OTHER CHANGES TO THE SITE, THE MATERIALS AND THE PRODUCTS, PROGRAMS, SERVICES OR PRICES (IF ANY) DESCRIBED IN THE SITE AT ANY TIME WITHOUT NOTICE. 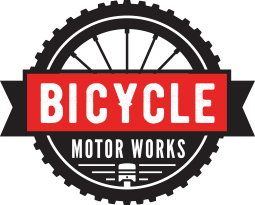 All payment plans must be authorized by Bicycle Motor Works and is subject to change. Payment plans are offered in two parts, First invoice is half the total invoiced amount for the order. The details of the order is outlined and itemized in the invoice. After the individual(s) receive the invoice, they must review the details of the invoice and are instructed to read the Terms and Conditions. Once the individual(s) have agreed and accepted the Terms and Conditions and the invoice, he/she can proceed to fulfill the first payment. The first payment is a commitment to purchase the total amount of the invoice when the order is ready for shipment/pick-up. Once the first payment is fulfilled production on the order will then begin. The second invoice or remainder of the invoice will be submitted 1 day before the order is complete. Standard build time is 5-10 business days, therefore the second invoice will be submitted within 5-10 business days after the first invoice has been fulfilled. (Some orders are subject to change and will vary on time). The order will be shipped after the last payment (the remainder of the invoice) has been fulfilled. There are no refunds on payment plans, customized built bikes are not qualified for a refund after it has shipped from our site. THE PARTIES have executed this Agreement as of the date first set forth below.